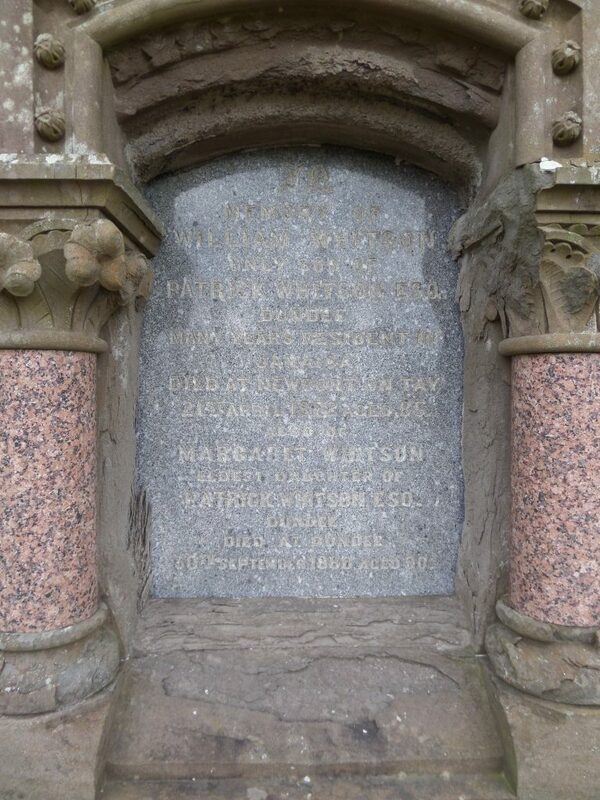 Margaret Whitson, a woman of means, was the sole surviving daughter of Patrick Whitson, flax merchant, of Dundee. She, along with her two younger sisters, Isabella and Jane, resided in the fashionable district at the west end of the Nethergate. Subscriber 7 – Patrick Anderson, merchant – a trustee and executor for Margaret Whitson’s estate. Subscriber 113 – Helen Jobson – a named friend and beneficiary. Subscriber 170 – Andrew Ogilvie, stockbroker – a trustee and executor for Margaret Whitson’s estate. Subscriber 212 – John Symers, banker – his wife was also a treasurer in The Female Society along with Margaret Whitson and a minor beneficiary (as was his daughter). Subscriber 216 – Mrs Captain Scott – a named friend and beneficiary. Subscriber 251 – Francis Whitehurst – a neighbour in South Tay Street. 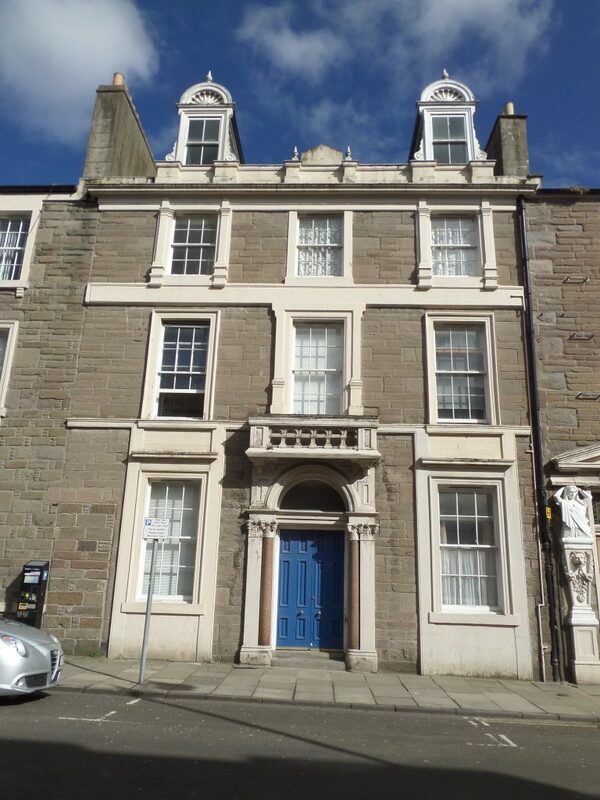 Having been the daughter of a notable Dundee townsman who had held positions as Bailie and Dean of Guild, it was unsurprising that the Whitson family resided in South Tay Street. The town architect, David Neave, had been responsible for the construction of the neo-classical terrace in South Tay Street between 1818-20. 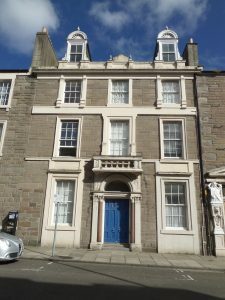 He had the reputation for having been the ‘favoured architect of Dundee’s mercantile elite.’ The likes of Patrick Whitson and his family chose to reside there for a number of decades, from the 1820s, it becoming a lasting home to Margaret and her sisters, Isabella and Jane. Her younger brother Patrick, also a merchant, was listed as having lived in King Street, prior to his untimely death in 1833. Their father, Patrick Whitson, died two years later in 1835. On their father’s passing, (their mother having died in 1829) Margaret and her two younger sisters became inheritors to his estate, valued at more than £7,000. Another beneficiary was their step-brother William (Patrick’s son from his first marriage to Isobel Maxwell). At the time, William resided in Jamaica although he returned to Scotland, ultimately having resided in Newport, Fife. A mere six years after the death of their father, Margaret’s sisters died, within three weeks of each other, in October 1841. Margaret and her older step-brother William became the sole survivors of the Whitson family. Stated to have been a ‘Retired West Indian Planter,’ William died in 1872. Neither Margaret nor her brother William had family of their own. 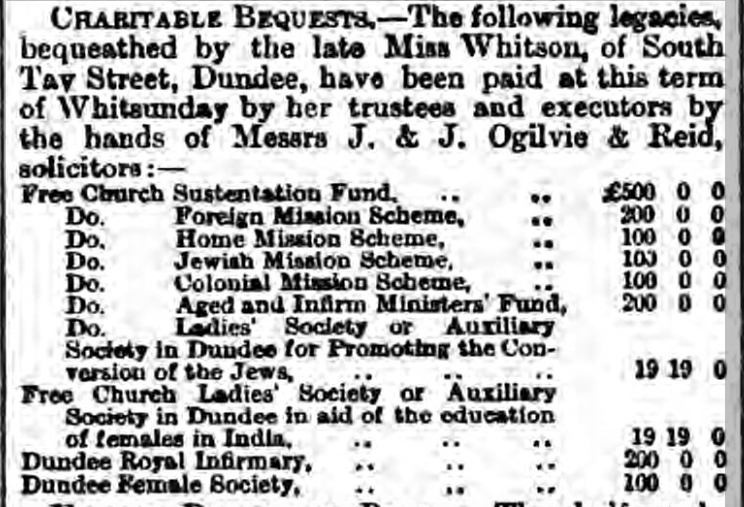 Margaret died on the 30th of September, 1880 of ‘the Infirmities of Old Age.’ A woman of considerable means, with an estate valued at £11,504 16s 11d (equivalent to £1,150,400 – therefore having been a millionaire), Miss Whitson, as evidenced in her will, had made a number of judicious investments, including railway stock. 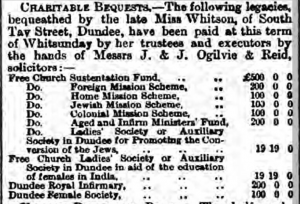 She left multiple charitable bequests, mostly to Free Church endeavours and also to Dundee Royal Infirmary. Old Parish Registers. Dundee. Births. 282/ 70 346. ScotlandsPeople website. Census Records. Dundee. (1851). 282/ 29/ 9. ScotlandsPeople website. Census Records. Dundee. (1861). 282/ 27/ 31. ScotlandsPeople website. Dundee Postal Directory, 1863-64. p.200. Dundee Central Library, Local Studies. Statutory Registers. Dundee. Deaths. (1880). 282/ 2 650. ScotlandsPeople website. Legal Records. Wills and Testaments. Dundee Sheriff Court. (1880). SC45/ 31 30. ScotlandsPeople website. Dundee Postal Directory, 1863-64. p.36. Dundee Central Library, Local Studies. Ogilvie, Mary Isabella. A Scottish Childhood and What Happened After. (1952). Oxford. George Ronald. The Dundee Directory, 1824-25. p.145. National Library of Scotland website. The Dundee Directory, 1818. p.135. National Library of Scotland website. Dundee Postal Directory, 1829-30. p.55. Dundee Central Library, Local Studies. Mitchell, Alison. (ed). Monumental Inscriptions. Volume 4. Dundee and Broughty Ferry. p.44. Scottish Genealogy Association. Legal Records. Wills and Testaments. Dundee Sheriff Court. (1880). SC45/ 31/ 2. ScotlandsPeople website. Statutory Registers. Forgan. Deaths. (1872). 431/ 10. ScotlandsPeople website. The information above about Margaret Whitson has been collated from a range of digital and hard copy sources. To the best of our knowledge it is correct but if you are relying on any information from our website for the purpose of your own research we would advise you to follow up the sources to your own satisfaction. If you are aware of an inaccuracy in our text please do not hesitate to notify us through our Contact page.